Buying a house is generally seen as one of most costly purchases one can make. It's especially true in China, where house prices continue to rise. Given what the challenge it can be to get on the property ladder in the country, it's probably no surprise that Chinese social media was buzzing with one particular property story last week. It started when a blog was published on the popular blogging platform the Tian Ya Yi Du forum, by a person writing under the pseudonym 'Proud Qiaoba'. Proud Qiaoba penned a tale that, if we hadn't been able to verify it ourselves, would seem like the plot of a pretty average airport romance novel. The lead character in Proud Qiaoba's account is a colleague, whom Chinese media have dubbed 'Xiaoli' (not her real name). Xiaoli, a woman from the city of Shenzhen in southern China, asked each of her 20 current boyfriends to buy her a newly launched iPhone 7. She then sold all of the phones to a mobile phone recycling site called Hui Shou Bao for 115,010 Chinese yuan (about £14,000), and used the money to put down a deposit on a house in the countryside. Proud Qiaoba added that Xiaoli "is not from a wealthy family. Her mum is a housewife and her dad is a migrant worker, and she is the oldest daughter. Her parents are getting old and she might be under a lot pressure hoping to buy them a house... But it's still unbelievable that she could use this method!" A hashtag which translates as '20 mobiles for a house' quickly began to circulate on Weibo, and became the country's top trend. It has now been used in excess of 13 million times. Many social media users, like 'small sand is growing', have expressed admiration for Xiaoli. "I can't even find one boyfriend. She can actually find 20 boyfriends at the same time and even get them to buy her an iPhone 7. Just want to ask her to teach me such skills." 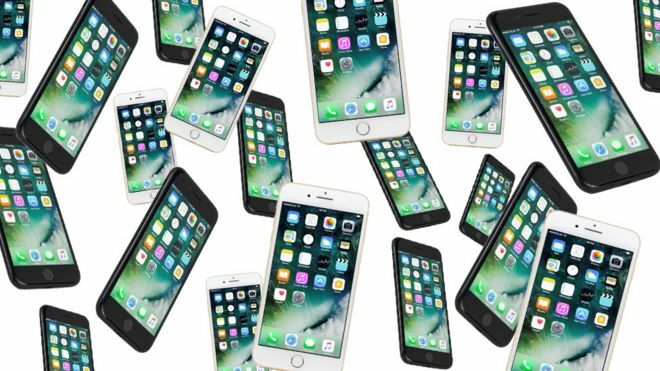 BBC Trending approached Hui Shou Bao and a company spokesperson confirmed that they had indeed purchased 20 iPhones from a female client at the beginning of October and paid 5,750 Chinese yuan (about £700) for each one. "Her day-to-day life has been affected (from the local media attention) and she doesn't want the media to continue covering this story," they said, "so she has turned down your interview request."